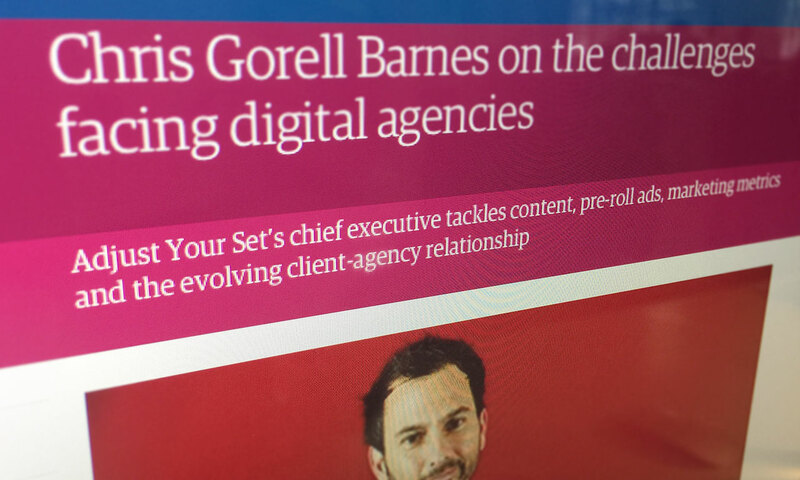 AYS Website - The Guardian: What Are The Challenges Facing Digital Agencies? The Guardian: What Are The Challenges Facing Digital Agencies? Following his Guardian Changing Media Summit appearance, our Founder & CEO Chris Gorell Barnes spoke to the Guardian about his concerns and hopes for today’s industry. "Most millennials think there are too many ads online. There needs to be another way where brands create stuff that people are actually interested in. That is taking an editorial approach, thinking about what resonates or is culturally relevant right now, and how to be the publisher of great content that customers want to engage with". What's the industry’s biggest challenge up ahead? "I’m a believer that brands which are really going to succeed and have a higher social purpose have an opportunity to create great social change. Brands that are going to really resonate in the future are ones that are going to stand for something larger than their products and their price. We’ll see a shift in brands thinking about how they work, how they act and what they want to communicate, which is going to make them better companies and also be better for the world". Read Chris' full interview over on The Guardian.